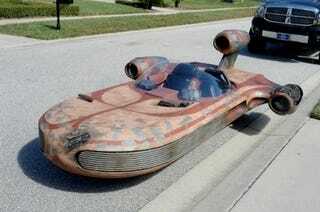 What Would Luke Skywalker Drive? The tiredest of autojourno clichés is "Lord Vader, your ___ has arrived." But why do we never ask: what would Luke Skywalker drive? Let's be clear here, we're talking not about a galaxy far-far-away in a time long-long-ago. We're talking about this galaxy in a time not so long ago that they didn't have cars. But there are tons of great answers. In our case, we're focusing on who Luke is: a poor moisture farmer out in the backwoods of the galaxy. And like all impoverished farmhands he's got a need for speed but is short on dough. Which is why he'd own a beaten-up 3rd-gen Camaro RS. Skywalkers are notorious gearheads, so the Camaro, despite years of abuse, manages to slide around the barn as if guided by some sort of magical force and is held together with bolts, bondo and rust. It's the perfect choice for a white knight who isn't, you know, that kind of white knight. Grab your lightsabers guys and gals and help us build a new cliché: what would Luke Skywalker drive?